On Saturday, Sept. 10th, from 10am – 2pm, three of the city’s top cultural institutions will be teaming up to host a free open house for high school teens. 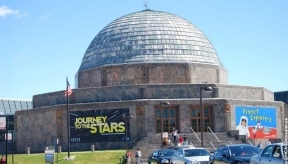 Adler Planetarium, The Field Museum, and Shedd Aquarium invite area teens to learn more about their exclusive teen programming and opportunities offered throughout the year. Attendees are encouraged to join the conversation on social by using the hashtag #MuseumTeens. Student IDs are required for free admission. Open house attendees can take part in video game challenges and informational programs, match wits with peers in a rocket engineering challenge, and have access to the Doane Observatory, which houses the largest publicly accessible telescope in the Chicago area. Participants will also have the chance to register for upcoming free fall programs including Adler’s new Game Making Workshops offering the chance to design and code video games. Teens will be able to visit the Museum for free, including open access to the Grainger Digital Studio from 10am–2pm. Students will be able to design their own field notebook, create LED pop-up cards, and solve an engineering challenge inspired by the natural world. Teens can also learn about the Museum’s teen programs, including curioCITY, which brings scientists into the city to explore connections between science and culture. The Museum will also offer free basic admission to Illinois residents.